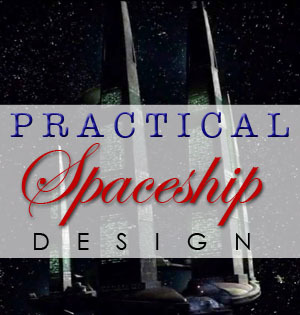 This article on practical spaceship design is part of the Science in Sci-fi, Fact in Fantasy blog series. Each week, we tackle one of the scientific or technological concepts pervasive in sci-fi (space travel, genetic engineering, artificial intelligence, etc.) with input from an expert. Eric Primm is an engineer for Boeing and has spent the past nine years making sure the wings don’t fall off various aircraft. He’s already provided some great posts on realistic fighting abilities and how to ask an expert. He writes fiction about philosophers and non-fiction about martial arts. You can find his musings on the arts on the STL Counterpoint blog. Science fiction loves a beautiful starship. Really, who doesn’t? 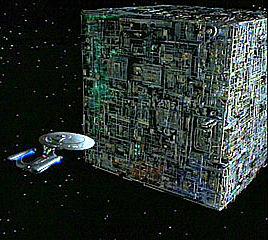 From the Minbari Sharlin to the Empire’s Star Destroyers to the Borg Cube to the Heart of Gold, aesthetics rule. From a practical standpoint, most starships in SF are poorly designed. They’re made to elicit that feeling of awe, but a ship designed from the viewpoint of economics1 and efficiency would be rather boring. Physics would still apply to post-scarcity societies. Rather than having to repair poor designs, ship operators would want to get the most use possible with the least downtime. This is accomplished by having great engineers, and the discipline of engineering is based on learning from failure. To make practical spacecraft, lessons from current design’s failures need to be studied. Shape, windows, and manned fighters are the easiest and most pertinent changes to make. In order to support life within a starship, it must contain atmosphere for the passengers. Outside the spacecraft is the vacuum of space. The structure must be sealed tight and not leak. In other words, spacecraft are big balloons. Inside the ship, the atmosphere must operate at homeworld standard pressure or, at least, a pressure that supports life. Because of the imbalance in pressure outside and inside, the ship’s atmosphere is pushing on the hull, trying to equalize. Logically, the hull is pressing back on the atmosphere to keep it contained. This means that even when not moving, the ship’s structure has a certain amount of force applied to it. In engineering terms, the structure is pressurized. Airplanes – at least the portion with people inside – and submarines are vehicles that undergo pressurization, and in general, these craft have a rounded shape. Propane tanks for the grill and helium tanks for blowing up balloons are rounded because it is the most efficient design to hold the pressure inside. The best shape for pressurization is a sphere; in the sphere, the pressure pushes equally in all directions. But inside a planet’s atmosphere the sphere is limiting. Aerodynamics and fluid dynamics are why the body of airplanes and submarines are cylinders. Practical starships would be either spherical or cylindrical, and most likely a combination of the two shapes. Add in maneuvers, environmental changes, gravitational fluctuations, weight modifications, pressurization cycles at airlocks, etc., and it’s easy to see that spaceships undergo a lot of force. The varying levels of force have an effect on structure known as fatigue. Yes, structures get tired. Instead of getting irritable and needing a nap, structures tend to crack and need repairs. The aerospace industry found this out with the de Havilland Comet, a commercial airplane that had several crashes due to catastrophic cracks. It was determined that cracks at square window cutouts grew large enough to cause problems. As the study of cracking grew, engineers learned that corners are bad for design. They create stress concentrations, which is as bad as it sounds. These are locations that love to form cracks. The sharper the corner, the higher the stress concentration. Therefore, designs that have gentle curves have lower stress concentrations. Windows on commercial airplanes follow this design rule. Doors in bulkheads on submarines are rounded at the corner for this same reason. A civilization that is advanced enough to build spacecraft will know and understand fatigue and fracture, and while their technology would be much more advanced than the current understanding, it makes sense that they would implement these basic design touches to ensure the safest vehicle possible. Rounded designs are practical. Look at commercial aircraft and submarines to see good examples of efficient structure. 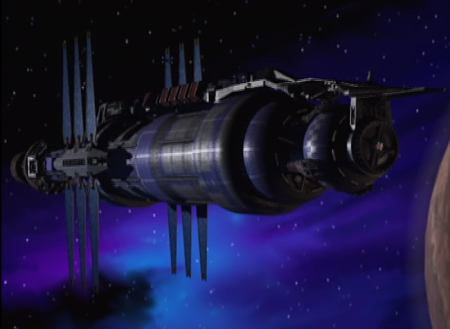 The best SF example is the space station Babylon 5 from the show of the same name. Note that it is cylindrical, which is close enough to a sphere for a good engineering tradeoff. 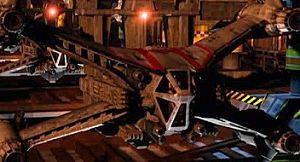 The worst SF example is the city ship from Firefly. That ship is horrible. It’s creative while being an engineering nightmare. Space is huge, and honestly there’s not much to see out there. Regardless, SF spacecraft tend to have windows, and even worse, they have windows so that the pilot can…erm, pilot. Sylvia Spruck Wrigley already talked about the dangers of visual piloting in her excellent post on Space Flight in Science Fiction. Since she is correct and spacecraft would be piloted by instrument, the pilots don’t need to see outside the ship. A window is basically a hole in structure with something clear filling it. In other words, windows are weak points. Putting important functions of the ship near weak points is not a good design option. Despite the ship’s mission, chances are good that it will encounter debris in space. Whether environmental factors like Micro meteors, debris from battle, or trash left behind by inconsiderates who also probably talk during movies, the ship will take damage. Therefore, engineers would locate navigation and the rest of the command center away from the outer surface and bury it deep in the ship. As it takes damage in a fight, the critical functions can still operate. Windows in spacecraft are often used to target other craft with lasers or projectiles. SF is correct in that missiles, or better yet torpedos, would use tracking software instead of being guided by hand. However, the equivalent of guns are often left up to the pilot or a gunner to shoot using simply their eyes. Combat between space fighters would not be like dog fights between aircraft. 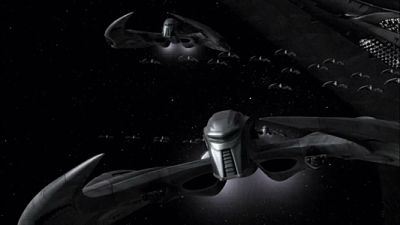 Smart militaries would keep their attack craft black to match the background of space, making it difficult to find. When fighting in the depths of space, black ships would be difficult to spot. Even fighting in a solar system with a star, the light, the tactics would be to get the ship against the background of black space. Targeting software would be needed for all weapons. With screens being relatively cheap technology, it makes more sense to have a solid structure outside with a screen and targeting computers inside. Starships, especially battle craft, would bury their command and control centers in the heart of the ship, where damage is unlikely. The fact that navigation and battle don’t need visual cues to operate means that these stations can be located anywhere on the ship. Battlestar Galactica does this well. Instead of operating like an aircraft, the Galactica bridge looks like a submarine command deck. This reflects the lessons that the Twelve Colonies learned from space combat. Unfortunately every ship in the Star Wars universe fails this one. 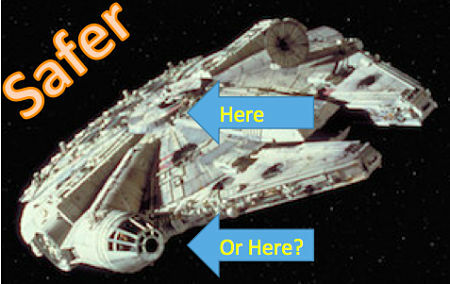 The Millennium Falcon is cool but hangs the pilots out there to be targeted2. Despite the prevalence of droids and AI, the vehicles in Star Wars rely on visual ship-to-ship combat. This is inefficient but much more exciting. When the X-wing fighters first appeared on screen during Rogue One, an actual cheer went up in the theater where this author saw the movie. The silhouette of that spacecraft evokes the feeling of the entire franchise. It represents hope. The X-wing is also an unnecessary risk of life. At the time of the franchise’s creation, drones were not thought of as war machines. Star Wars extrapolates its space battles from air combat, which is fine. But as modern armies are finding out, the weakest part of a fighter is the human inside it. This is a truth that will carry into the future, and a spacefaring civilization would advance drone technology to be its main fighter force in space. Instead of a carrier ship loaded with fighters, the practical starship would be a command and control center with unmanned craft. The pilots can be located safely within the depths of the command ship3, each controlling a single drone or a squadron of craft. As has already been established, visual flying and warfare are unnecessary; so, why put a being in a craft separate from the big ship? If saving a life for the sake of life itself isn’t enough, then think about the time and money needed to train a pilot. The skills necessary for flight take a long time to develop, and by putting a pilot in a fighter, a significant investment is risked when the pilot is outside the main ship. Advanced civilizations would not accept these risks, and unmanned attack craft would be easily in reach of a society with AI. By removing the pilot, the drones lose unnecessary weight and become more maneuverable. There’s no life support system necessary, and the structure can be designed to fly in a manner that would harm a being contained within. Earlier this article established that structure undergoes significant forces, and this is also true for anything inside it. Biological bodies are weak, and despite mitigating factors such as crash couches, exercises, and drugs, the body is still the critical weakness. This limits the forces that can be placed on the structure. By removing the body, the engineers can design a craft that is smaller, more maneuverable, and more effective. Unmanned craft are the fighters of the future. The Cylon Raider is the closest to demonstrating these facets of design, but those craft were autonomous cyborgs themselves. In the new version of the show, they also contain biological circuits. This is a potential limiting factor but not a fatal flaw. The fighters from Babylon 5 are beautiful but limited fighters. Spacecraft are one of the best parts of SF. Whether civilian transports, smuggler’s freighters, heroic fighters, or evil battleships, nothing says possibilities like spacecraft. As SF has changed over the years, the ships have changed as well. The golden age of rockets gave way to Star Wars on to Babylon 5 to the excellent ships of the Expanse. 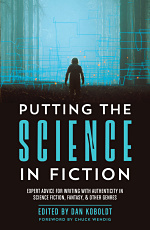 As the knowledge of physics increases, SF incorporates that knowledge for better stories. The same is true of the vehicles of SF. The course of the genre has always moved from what is possible to what is plausible, and starship design has moved from possible to practical. Even assuming post-scarcity societies, engineers would still strive for efficient designs and drive out wasteful extravagances. I feel like I should turn in my nerd card now. As much as I love the iconic Star Wars designs, the ships in that universe reflect that instead of science fiction, Star Wars is science fantasy. Warfare already includes significant signal jamming efforts, known as electronic warfare. Modern militaries are very good at dealing with this, and it is easy to assume that advanced civilizations would understand and be able to conduct electronic warfare much better. Battlestar Galactica demonstrates this by the communication between the colonial Vipers and the crew on the main ship. Really great, useful article! I’m thinking that spaceship hulls will be super thick and strong enough to take a battering from fast dust and radiation. That futuristic material might also be used to build fortressed cities that can withstand nuclear warheads and whatnot. Another beautiful to look at, yet highly impractical spaceship design is the city/spaceship of Atlantis, from the show Stargate: Atlantis. Atlantis is a sprawling snowflake shape that’s nothing but towers and windows. At least the end results of this design are sort of realistic in that there is always massive damage and heavy casualties whenever Atlantis gets stuck in a space battle. Great article. One point of contention though; there’s no good reason to paint ships black. One of the major issues in space is heat regulation. Without any air to cool your ship, your only option is radiating excess heat away (and with those massive engines, you have a lot of excess heat to get rid of). Your black coated ship might be hard to detect with human eyes, but on an infra-red camera it lights up like a candle in the night from anywhere in the solar system. I’ve worked with a lot of coating’s in the aerospace and hyperf, auto industry, and most Syfy doesn’t take into account radiation shielding seriously. Or small high-speed meteorites, besides the force shields of starters. For long distance space travel I was wondering if spraying lead to the walls of the ship would be a viable option. A lot of spacecraft design in SF is oriented towards military usage. I’m looking more towards civilian usage, mainly passenger & freight (early on I would also expect to see both in the same ships). 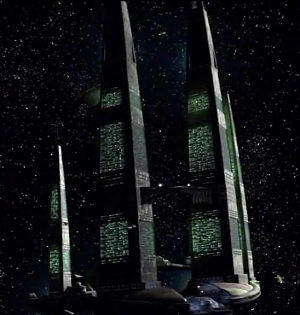 Granted, as an early ship without a Federation and Starfleet, the ships pretty much have to fend for themselves, so some level of armament is needed. But yes, I’d see “windows” to be just as impractical on a spaceship it is on your computer (sorry, Linux joke). Even when my timeline was still at the stage of moonbases, I had them using “porthole screens” (and at the time I thought of them, flat-panel tech was still crude). The one issue with unmanned drones being controlled from a command ship might be a light speed limit of communications. 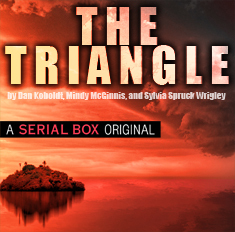 David Weber’s Honor Harrington series uses FTL communication as a major plot point – and as you say, space is enormous. If it takes 8 minutes for sunlight to reach Earth – how fast can you communicate with a long range drone? Great article. The only thing I would point out is the reason for windows. While you’re correct that there would be no flying by sight, windows would be included for psychological reasons. Studies have found that when people are in enclosed spaces, being able to look out, past the walls, improves mental stability. Submarine crews don’t have windows to look out, but they aren’t under the water for years at a time. So, I think any space craft meant for long term operations would have some sort of windows. Large craft could have a seperate room for viewing outside that could seal itself in emergency, or something along those lines. At least that’s how I view the issue. Which was my idea of the “porthole screens”. And for the potential other problems of windows on a ship, I still think you’d want some on a ship’s bridge, in the event of system failures, in order for the bridge crew to have an alternative way of seeing outside for manoeuvring. And yes, the bridge would be to the outside of the hull for the same reason. And if you consider the psychological reasoning, if you are having a spacecraft taking on a functional equivalent to an earth-locked vehicle, there would be a tendency to configure it in a similar fashion. Especially in the early days of space travel. Yeah, I’ve been thinking these points over for a long long time.